Without a doubt, it's a challenge being a mom, working full-time, writing, promoting a book, and being an MFA student. Sometimes, I feel like I go from one job to another, so when it's time to cook dinner, it's a source of major stress. I actually like to cook, but I don't know how to cook too many things. This past year, I've focused on eating fresher foods so I'm not in favor of box-a-meals, although I do use them. I'm fortunate to have a dietitian at work and I've recently starting keeping a food diary on My Fitness Pal. My meals are too carb heavy so I was challenged to come up with some other ideas. I'd like to branch out and learn more quick meals so she gave me an awesome cookbook, The New Soul Food Cookbook. It's actually a book for diabetics which I'm not, but I am trying to make meals low in carbs and sugars to help me lose weight. It has delicious looking recipes with only a few ingredients-Perfect for a working mom. I can't wait to try some. 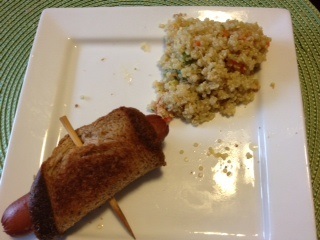 Tonight we made a really tasty meal and my daughter actually made the hot dog dish. I made the quinoa salad. I put some melted butter in a small bowl, and she painted slices of 100% whole wheat bread. She put a turkey hot dog in the middle, then wrapped the bread (buttered side out) around the hot dog. We fastened it with a skewer because I didn't have a toothpick. We baked for 18 minutes on 325 degrees. I made the quinoa according to the instructions on the box, except I used vegetarian broth instead of water to give it extra flavor. I put some yellow squash, carrots, and zucchini in my mini food processor, then added that to the quinoa. I also threw in some grape tomatoes and green beans from our garden. Quinoa is a good alternative to rice or pasta. It has protein in it and isn't as starchy. Plus it's a great dish to hide your veggies in. We added some fresh strawberries as another side dish. It was a filling meal, not to mention nutritious. It was great to have my daughter actually make part of the meal and she was so proud of herself. It only took 20 minutes, and was minimal clean-up. Two big positives in my house. I remember when I first heard about steampunk. It was a new and emerging subgenre that was getting a lot of press due to the release of Scott Westerfeld's Leviathan. I checked it out and fell it love with the look and feel of the period. The Victoria era wardrobe juxtaposed with the metals and innovation of the steam era. This past week-end I attended DogCon2 at the Thurber Center. There were writing workshops, readings, Tarot Card readings, and kid's activities. I attended a workshop on Steampunk so I could learn more about it. The speakers were from a local Columbus group called Airship Archon. They discussed the clothing and accessories of which the majority are handmade or hand sewn. They named estate sales, vintage shops, and Etsy as great places to find materials. If you live in Columbus, they recommended, The Alley Store. They also discussed the literature that inspired them. From the classics, you have Jules Verne and H.G. Wells. Verne wrote novels such as Twenty Thousand Leagues under the Sea, Around the World in Eighty Days, and The Carpathian Castle. H.G. Wells is probably best known for The Time Machine, but also wrote The Invisible Man and The Island of Doctor Moreau. For more contemporary literature they mentioned Gail Carriger's novels. They also noted that it's hard to find good steampunk literature that is true to spirit they embody at Airship Archon. Most of it seems artificial with all things steampunk thrown in haphazardly. They are an amazing group of people. They hold monthly events which are open to the public. They get together to create costumes or other steampunk related items. They also speak at numerous conventions. The list of topics is listed on their website. One is that steampunk is considered a subgenre of science fiction. For some reason, I never put that together. Two is that there are subgenres of steampunk such as clockpunk, meatpunk, dieselpunk, and cyberpunk. Each inspired by an era of invention. I also learned how to make a pair of steampunk goggles from welder's goggles. Each speaker was so creative and a pleasure to listen to. I came away with an idea for an art piece so we'll have to see if that works out. Need a few more books to read during summer vacation? 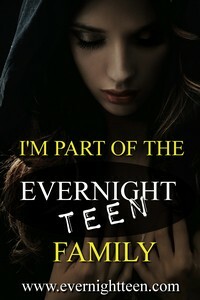 All Evernight Teen titles, including my YA mystery, Unraveled, are on sale for a week on Amazon.